Another dungeon crawler in the vein of Pokemon Mystery Dungeon! Dungeon crawlers can be an absolute blast. In the case of PokÃ©mon's Mystery Dungeon spinoffs and other recent endeavors, they can also present quite the challenge, even when released in one of the cutest packages possible. Rogue Ninja, an 8-bit RPG that takes a few pages out of the random dungeon trope, is an adorable but austere romp through the world of ninjas to track down the Shinobi's Secret Scroll (or to save a princess, depending on your course throughout the game.) It's a great addition to any roguelike fan's library with much to offer in a small, portable package. 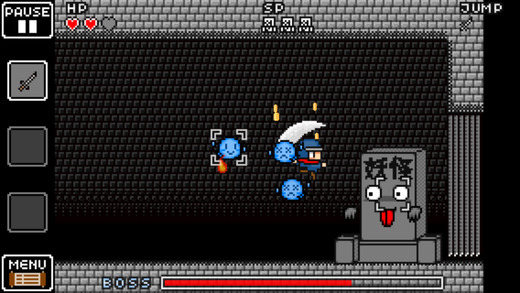 The name of the game is old-school dungeon crawling. As you explore the Japanese-themed world you'll be thrown into plenty of different areas rife with colorful monsters for level-grinding, items to loot, and mazes to navigate. To be blunt, you'll be doing plenty of wandering around aimlessly. And funnily enough, that's where the fun lies. The on-screen map goes a long way when trying to chart a path to the next floor, but having a long look around to see which enemy will pop up next -- perhaps a fire red enemy crab monster? - and what type of loot you can accumulate. Hacking through the enemies that jump in your way all in an effort to uncover the game's secrets is the true essence of a roguelike, and it's where Rogue Ninja shines. Unfortunately, it can be quite easy to fall in battle, especially if you're not too sure what's around the corner. Once you're downed in battle, all your experience and items are lost and you're expected to start from the beginning in another, randomly generated area. And death will come swiftly, if you're not prepared. Unfortunately, lack of skill or luck isn't the only means of facing a swift end. On-screen touch controls, typically the bane of most gamers' existence, rear their ugly heads. The game is presented in portrait mode, but controlling your character feels quite awkward for larger hands and even my own smaller fingers. You'll mistakenly hit the wrong command over and over, or miss it entirely. Sometimes your input won't be recognized, and that could easily mean the difference between having to restart from the very beginning or collecting yourself and moving forward. That isn't to say it's a bad game. It's punishing, but addictive in a way that keeps you coming back from the start to reach the same level you attained previously. It's that masochistic feeling that propels you from start to end. And from the very beginning you'll appreciate Rogue Ninja's painstaking efforts to resemble that of an adventure of the 8-bit age, rife with brilliant hues, quirky character sprites, and sprawling dungeon. Q-Cumber Factory did a fantastic job in designing this great homage to a classic era of gaming, right down to the on-screen control pad and buttons. Accompanying chiptunes ensure you're suitably immersed in the retro world so lovingly crafted here, and if it weren't for the occasionally touchy tactile controls, it'd be easy to forget you're actually gaming on a modern device. This is a classic roguelike, positives and negatives combined. It does a great job of throwing players back to a simpler age of gaming and despite control issues which could easily be improved with a landscape mode, and it's a simple yet deceptively complex game that ensures you try again and again to improve on your previous outing. It could benefit from a bit more polish, but it's an outstanding mobile title for a genre that deserves all the attention it can get.